We had the officer’s quarters on the white boat behind it and thought the stay was really comfortable and convenient. Our room was facing the water and had a great view. 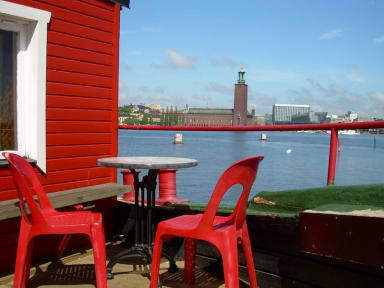 It’s also not far from Slussen where you can catch the #2 bus to deeper parts of Sodermalm. Our room was clean and relatively spacious. No complaints. Good value for Stockholm! Good to stay, especially for young people; beautiful senaries and convenient to go around city. Really nice staff, nice location, it is a boat so yes the roof is quite low, so maybe if you're tall it's not the most comfortable place. The entrance room is super nice to hang out. Would definitely recommend! Fabulous value, brilliant location, friendly staff, good inexpensive food, showers powerful and hot. A word of advice: bring a double power adaptor - if there's more than one person in a cabin, you'll need extra power sockets. Really unique hostel, its worth the experience and the gorgeous views. Stayed for 2 nights. Convenient location near the subway, walking distance to old town over the bridge. Place is really cramped, not ideal for people wanting to stay longer than 2 day and with lots of luggage, there is really very very little space (not recommended if you're claustrophobic), 4 people backing their bags in the room at the same time was impossible, had to take turns =)). Good stay all in all. An OK place to stay for a night or two. 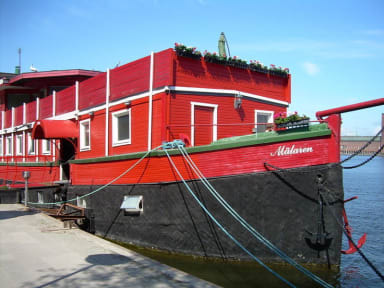 Nice location and nice to be on a boat, but the rooms are tiny. I got a top bunk and there was about two feet between the bed and the ceiling. There was very little room to move within the room too - just bunk beds with a gap in between. The rooms are small, warm, and there is absolutely no air flow. Many of the reviews mention this, but it was significantly worse than what I thought it was going to be like. The doors shut very loudly and I was woken up multiple times through out the night by door closing. We parked where the staff told us to, and got an expensive parking ticket. Overall, I would not stay again.